Welcome aboard HMS Hinchinbrook (28) - Nelson's first command as a post-captain! This is my first post, of what should hopefully prove to be many more. If you're reading this with a mounting sense of excitement on account of not being the only teenage Nelson enthusiast in the entire world including the Moon, then congratulations - you've found a kindred spirit! OK a little bit about me now! 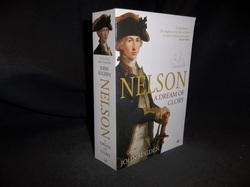 I have been a huge Nelson fan for five years now, and it is my dream to be a Nelson scholar one day and write books on this most fascinating of subjects. I have scoured the Internet for a blog such as this, but I couldn't find one :'( . Because of my disappointment, I have now set up my own, and I hope that you will enjoy looking at it as much as I am currently enjoying writing it! Here, I will be posting info, trying my hand at a bit of Nelson scholarship, posting links to other interesting websites and sharing out posters made with my awesome skills at Microsoft Word. I will try to get around to building some comprehensive biography pages and also a reading list with my reviews of the books on it. Today, I have a poster for you as a welcome gift! It's a verse about Nelson and some other famous admirals of the time from Lord Byron's poem Don Juan with pictures of the people mentioned. The file is just down below. It's only Word 2003, so it should be compatible with just about any computer. Anyway, that's enough from me for now! Enjoy the blog! Bonjour tout le monde! I hope you're all enjoying sifting through the blog. As I mentioned, more pages will be added when I get the opportunity. Today's Nelson-related post is... CATCHPHRASES! Are you EXCITED? My own catchphrase is WWND (what would Nelson do?) and it is actually very helpful in terms of life and easy to apply to various situations. Seriously, I find that it is really good for bolstering confidence. When you've got a test - WWND? Answer: go in there and do your best! When you hurt yourself - WWND? Answer: carry on, you'll be fine! When you're having trouble with your friends - WWND? Don't worry - you'll come out of it better than they will! Nelson was a great role model in that respect - he was always 'out there' leading his ship into battle, and never hid away on a frigate. Even at his death, when anyone could be forgiven for being a little preoccupied, he was concerned that the ships anchor, and so weather the storm that he knew would follow the battle. Anyway, I think that the key essence of WWND is to always do your best, to follow orders with just enough of your own ingenuity, and to never, ever care about what people say. In a later post, I plan to explore the less good points of WWND! Helloooooooo loyal followers and random visitors! As promised, today I'll be discussing the times when WWND is not so useful. Ok first off: You have a boy/girlfriend but you start fancying someone else - WWND? Answer: go off with the new one, shut your present partner out of your life and leave them wondering where it all went wrong. This is BAD. It's also arrogant - you can't just dismiss people like that. Next up: Your teacher gives you homework that you think is boring and not academically stimulating - WWND? Answer: change it to suit your own interests, or don't do it at all. Very unwise. Sometimes your superiors DO know better than you, and aren't very happy when you disregard orders. Nelson did this quite a bit, sometimes to great effect, like at Cape St Vincent, but sometimes disastrously - he really didn't know enough about the local coast to launch the Santa Cruz attack. Note: HMS Hinchinbrook does not support changing homework tasks and does not want to be used as an excuse for doing so. Then again, if your teacher is anything like Admiral Jervis, the idea of not doing work will probably never even cross your mind! Nelsonic ingenuity = detention. Finally: someone dares you to do something dangerous - WWND? Of course! Who is he/she to say I can't do something, anyway? NO! Seriously, that is not good! After all the person who is daring you to do something isn't acting in the true spirit of WWND - never ask people to do what you wouldn't do yourself. Ok, I'll add more soon! In the meantime, enjoy the new stuff on the website! OMG I WANT!!!!!!!!!!!!!!!!!!!!!!!!!!!!!!!!!!!!!!!!!!!!!!!!!!!!!!!!!!!!!!!!!!!!!!!!!!!!!!!!!!!!!!!!!!!!!!!! Ahem... That is all. However, there is also a little museum attached that contains many Nelson-related things, including (wait for it)... his BABY CLOTHES!!! That is just the cutest thing EVER! Everybody say awwwwwwww! I can't wait to go, and I'll post about it as soon I get home (I have to go to Dorset). I have made a Nelson T-Shirt for the occasion - it has the JF Rigaud portrait on it, with the quote 'first gain the victory and then make the best use of it you can' and 'I <3 Nelson' underneath. FUNTIMES! And now some sad news... I ordered A Dream of Glory from Amazon, but I had to cancel the order because it wasn't going to arrive before I went on holiday. I cried for three hours (not really) when I had to click 'cancel'! Honestly, I swear that I will NEVER actually get my mitts on a copy long enough to read it! Most elusive book in history? Almost certainly. And finally... A proposition. I'm thinking of setting up a Young Nelson Society for teenagers like me! Please use the contact page to tell me if you would be interested in joining if I managed to set it up. We'd probably have a newsletter, go to HMS Victory/National Maritime Museum/places like that in a group and maybe even the occasional Nelson-themed party - think Naples in 1799! So, again, do please get in touch - it would be great to be able to set something up! As you have undoubtedly noticed, there is LOADS of new stuff, and I can't take any credit for it. The 'people', 'links', and 'ship's log' sections have all been done by my lovely (online) buddy Rae-Rae! Since she's introduced herself, I think I'd best do the same. Basically, my name is Rosie, I'm 14, and me and Rae-Rae both share the same vision of keeping the flame of Nelson's memory alive for a new generation. I'm also interested in getting more girls and women into military/naval history, as it's one of the few areas of history that doesn't have a young poster girl to present documentaries and write bestsellers and make it fashionable. And now a report from my holiday... I saw NELSON'S BABY CLOTHES! And as promised, they were very cute. There was a little T-Shirt kind of thing, with a matching jacket, a little baby hat and a TINY little pink-and-white woolly sock! And in the gift shop, I FINALLY got my copy of A Dream of Glory. It's beside my bed now, calling to me to sample the delights inside... Oops that was creepy (sorry)! While there, I also found out that, in addition to Euryalus, Swifsure (74), and Agamemnon (64, and Nelson's favourite ship) were both built there, as well as a lot of other ships not at Trafalgar. There was also an interactive game where you could be the captain of a 74! I won first time, by following the wisdom of WWND. I really recommend a day out there, and there's a lovely little boat trip too. It's way out in the country, so quite hard to find - when I went yesterday. there were COWS ALL OVER THE ROAD just to give you an idea of how far out it is! Just a quick note to say that this section of the blog will be moving to the new section, Home Harbour! Thanks!